Kamela system, The Bleak Lands region. In the early hours of the 11th of April, a large capital battle was fought between forces belonging to Did he say Jump [JMP-N] and FETID [FETID] to local resident alliances over a tower in the system. The Bleak Lands continue to be a volatile region. With the withdrawal of Dead Terrorists [IKILU] from the area in order to support the Low Sec Voltron (LSV) campaign in the north of New Eden, Did he say Jump under the renewed leadership of Predator Elite led a standings reset with several militia and pirate groups in the region while allying once again with FETID. The move caused former allies to clash as enemies now, leading to a Local Is Primary [CTRLV] fleet to reinforce a Did he say Jump tower in the Kamela system, which serves as the alliance’s staging. The tower in question is used for capital production and is considered an important strategic asset of Did he say Jump. Not wishing to wait a full reinforcement cycle, Did he say Jump managed to manipulate the strontium levels in the tower, giving it and its enemies a 3 hour window to form. While this caught its enemies off guard, it also meant the alliance had to form quickly, calling its allies FETID and the Gallente militia to form a joint fleet. Did he say Jump and its allies managed to form a mixed fleet of strategic cruisers and armor battleships supported by two capital squadrons. The entire fleet reached 100 pilots and assembled in Kamela itself, waiting for its enemies to make their move. Local Is Primary and its allies were not idle either and gathered their own fleet, an estimated 80 pilot armor battleship fleet supported by a squadron of dreadnoughts as well as a few triage carriers. The force made its way to Kamela, warping to the tower as its invulnerability period expired and setting up near its shields in order to start bashing the tower. At this point Did he say Jump and its allies warped to a perch on the grid before warping near the battleship fleet, lighting a cynosural beacon for the FETID capitals to jump in while warping its own dreadnoughts from a staging tower in the system. With both sides’ dreadnoughts entering siege cycles and opening fire, the battle began. 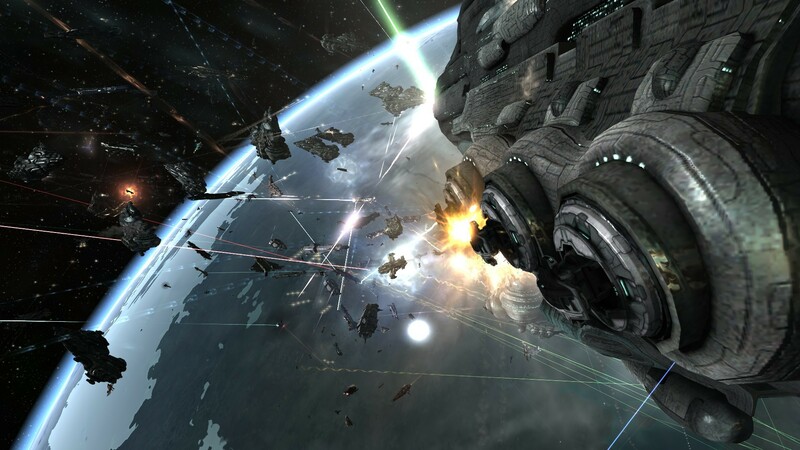 The fight from the start was a close range melee, with both sides focusing on each others’ capital ships. A murderous exchange took place dreadnoughts pummeled each other with capital armaments. As the two sides fought Together We Solo [LINKS] lit a cynosural beacon at a distance and brought a capital squadron of its own, including artillery cannon Naglfar dreadnoughts to aid Local Is Primary. With the addition of more hostile dreadnoughts on the field, the sub capital fleet for Did he say Jump swiftly reacted, swarming the new arrivals while its own dreadnoughts concentrated on the Local Is Primary capital force. Carriers and dreadnoughts on both sides were felled as monstrous volleys overwhelmed shields and armor plates. Yet as the battle progressed, it was Local Is Primary’s side that severely lost the exchange, losing at times 3 or 4 capitals for each one of Did he say Jump that it managed to destroy. As the two dreadnought forces continued to fire mercilessly, Did he say Jump’s sub capital force had managed to overwhelm the long range dreadnoughts of Together We Solo, breaking them one after the other and thus lessening some of the pressure from its own dreadnought force. Whats more, with the overall number of enemy capitals diminishing, support ships from the sub capital force were recalled to the side of the dreadnoughts in order to help hold down enemy battleships as the dreadnoughts turned their formidable guns on the Local Is Primary sub capital fleet. One by one, the surviving Did he say Jump dreadnoughts started volleying battleships, who could not withstand the capital fire barrages. Local Is Primary attempted to stream more reinforcements into the field, jumping in a second wave of dreadnoughts, but by now it was too late. The reinforcements soon found themselves overwhelmed by Did he say Jump’s sub capitals, forced to warp off or face utter destruction. With the capital engagement won decisively by Did he say Jump and its allies, the sub capital fleet was able to switch targets, closing in on the battleship fleet and targeting its logistics wing in particular. Caught between the capital fleet and its sub capital support, the Local Is Primary battleship fleet was hammered on both fronts and losing ships rapidly. Rather than risk total extermination, the fleet withdrew, allowing the Did he say Jump and its allies to claim victory. Though bloodied, Did he say Jump and its allies had no choice but to secure the tower, deploying cynosural inhibitors and standing guard over the tower with its sub capital force in order to extract its remaining capitals. However, before they could relax and repair the tower, Local Is Primary and its allies returned to the field, bringing a 70 pilot battleship fleet against the remaining 50 pilots for Did he say Jump and allies. Warping straight to the Did he say Jump force, both sides once again clashed at close range, leading to a continuation of the battle. This fight was more even sided at first, both fleets targeting each others’ logistics wings. Another murderous exchange occurred as Guardian logistics cruisers on both sides were massacred, decimating both sides’ logistics wings. However, Did he say Jump scrambled triage carriers to the aid of its fleet as the two fleets started focusing on mainline ships. Battleships on both sides were volleyed off as remaining Guardians tried in vain to repair damaged ships. Yet with triage carriers landing, Did he say Jump managed to stabilize fast, losing only a few mainline ships and swiftly recovering. Local Is Primary though, was unable to tank the incoming damage and started to lose ships at a rapid pace. Fighting hard, Local Is Primary kept attempting to break through the tank of the Did he say Jump’s ships in vain. As its pilots kept fighting valiantly, they were mercilessly cut down by the Did he say Jump strategic cruisers and battleships, the entire fleet annihilated. With only a few survivors managing to flee the field, Did he say Jump and its allies finally managed to claim real victory, repairing the tower and thus securing their objective as well. Thus, the allies departed, bringing an end to hostilities. Battle report for the Kamela system can be found here. All told the battle lasted 45 minutes overall, with a 30 minute break separating its two parts. Time Dilation was not reported and the system saw 250 pilots at the start of the battle itself. Did he say Jump and its allies lost 34 ships in the fighting, including 9 dreadnoughts, 1 carrier, 5 battleships and 1 strategic cruiser for a total of 45.27 billion ISK damage. Local Is Primary and its allies lost 161 ships in total, including 15 dreadnoughts, 5 carriers and 61 battleships for a sum of 94.15 billion ISK damage. I am requesting for my mommy. She doesn’t always want to earn money off them, her purpose is to utilize her blog site (as soon as popular) as well as use it as referrals to perhaps aid her get a newspaper article. She has a title for one called “Response to Life’s Troubles”. Where can she publish blog sites and also they end up being popular? She posted it currently on WordPress however there are 3 million individuals publishing blogs hers obtains lost in the mix. Any kind of pointers?. I’m wanting to consider blogs containing music I like, however filtering via all the separated, outdated as well as crap blog sites is a problem. I understand there are thousands of blogs, is there a good source to choose the favored ones?. Hey there! Quick question that’s totally off topic. Do you know how to make your site mobile friendly? My website looks weird when viewing from my iphone 4. I’m trying to find a theme or plugin that might be able to correct this issue. If you have any recommendations, please share. Appreciate it! Where online can a recognized psyciatrist message write-ups (or blogs) for them to end up being preferred? Howdy very cool website!! Guy .. Beautiful .. Wonderful .. I’ll bookmark your site and take the feeds additionally?KI am happy to search out so many useful information here in the post, we need develop more techniques on this regard, thanks for sharing. . . . . .